If you are familiar with chiropractic care, odds are you have probably already experienced its ability to instantaneously relieve certain pains. In Carlsbad, CaliSpine is one of the few places that offer chiropractic care alongside extensive rehabilitative exercise and tissue work. Chiropractic care is incredible, but very few people understand what it is, how safe it is, and how it can help you. Daniel David Palmer developed the field of chiropractic in 1895. Chiropractic care is built upon the idea of correcting subluxations, or misalignments of the spine. By adjusting or manipulating the vertebrae of the spine, the spinal cord and its nerves become freed and allow proper healing of the body. We like to compare a spinal subluxation to stepping on a garden hose (nerves) and stopping water flow (impulses). At CaliSpine in Carlsbad, chiropractic care is mainly used for musculoskeletal issues. Some patients visit our office with sharp pains, indicating that a joint is “locked.” Chiropractic adjustments often eliminate these pains instantly by freeing the affected joint, whereas message and exercise techniques often fail to relieve this type of pain. Patients experiencing dull/achy pain are often suffering from muscular tightness or spasms. Even though they may not have pain from a locked joint as described above, chiropractic adjustments can help to relieve pressure on a nerve that might cause the affected muscle to spasm. Yes! Chiropractic adjustments are very safe, and we have never seen an injury in our office from an adjustment. If adjustments worry or frighten you, you may want to consider that the sugary and processed foods you eat, or your daily drive to work, are both statistically more dangerous. 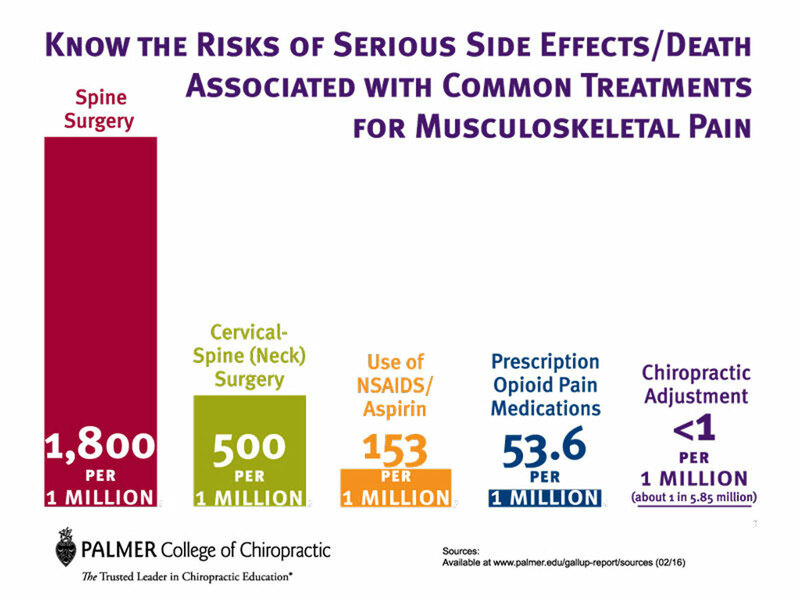 The graph to the right represents the different treatments for spinal pain, and the number of serious injuries or deaths related to them. We have had numerous patients in our office that have been recommended for spinal surgery by their primary care medical doctor, but we were able to eliminate their pain and return them to the activity that they love without invasive methods. Chiropractic adjustments are non-invasive (do not require cutting or inserting something into the body), and often give patients immediate pain relief. When combined with corrective exercise, pain relief becomes permanent. 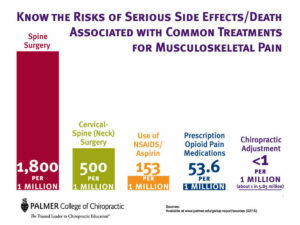 Do You Qualify for Chiropractic Care? We believe that a majority of people could benefit from chiropractic adjustments in one way or another. The most affective way chiropractic care may help you is if you are suffering from any sharp pains, which could indicate that you have a “locked” joint which is not moving properly. One adjustment can completely reset or realign the joint and allow for full range of motion to return. Some elderly, and people who have bone diseases and weak bones, do not qualify for chiropractic care at CaliSpine. Although adjustments cannot be done on individuals with weak bones, we are still able to treat them with rehabilitative exercise and scar tissue breakdown techniques. The CaliSpine Method is the best way to reduce your pain and improve posture and function. Our method includes spinal adjustments, scar tissue breakdown, and functional rehabilitation. Adjustments are extremely beneficial for quick relief, but in a world where sitting and poor posture dominate our daily lives, repetitive corrective exercise is needed to improve posture and reduce pain. CaliSpine is one of the few places in Carlsbad that focuses on chiropractic, massage, and exercise; stop by our office or follow our blog and social media to get advice on postural correction. How about pain aches in back shoulder blades pls? Any exercise to relive it? Ginny, thanks for reaching out! Where exactly do you feel the pain and when does it usually appear? Is it a sharp or achy kind of pain? If you could give us a little more details we’ll do our best to help! Spot on with this write-up, I truly assume this web site wants much more consideration. I¡¯ll most likely be once more to learn much more, thanks for that info. Great post Andrew. I have been a Charlotte nc Chiropractor for many years now, and have a thriving practice. I still am shocked by how many people do not know the great benefits of chiropractic care. I appreciate you spending some time about the beginnings of chiropractic. We do a lot of education at the office, and I have seen more of your blog. Great information. Keep up the great work! Sign up to get more stuff like this straight to you inbox!